Honestly, I'd prefer to not ever max out my credit card.. but for the sake of this question.. I'll just say Kohl's. They have all the things I could want. Household goods, kitchen stuffs (hello, Bets), seasonal items, ridiculous sunglasses, clothes for all seasons, smelly-goody products, and a jewelry counter. They also have chocolate, which I've never purchased, but is important since they sell "food". 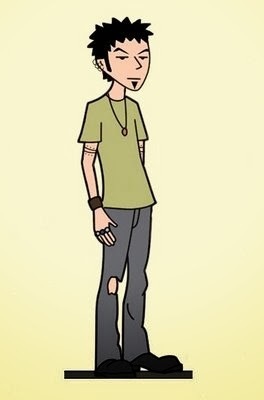 Trent from Daria. Mysterious, piercings, in a band, older brother.. /swoon. Sesame Street.. there was nothing better than Sesame Street. My bike? Does that count? Actual toy, toy though.. probably my cars. Since the linoleum in the kitchen was squares, 2 cars would fit into one square and they would be "home" then the lines between the "houses" would be the "roads". Good times. Sometimes we even had accidents. And I only preferred to play in the main thru-way where everyone walked into the kitchen. 11th grade. It was 7th until the VX-1 Christmas Party last year when my black, strapy, shoes finally gave up the fight and I had to toss them. Now it's my white, round-toed dress heels with the black scuff marks all over the backs that were purchased for my junior year of high school when I was a junior marshal. I played the Euphonium in middle/high school but I started out on the Trombone for about 1-3 months before switching over. I can also play the piano, with my left hand.. and I can only read bass clef. Megan Problems. 1. To the person that holds an instrument back, ewww. All that spit. /shiver. 2. 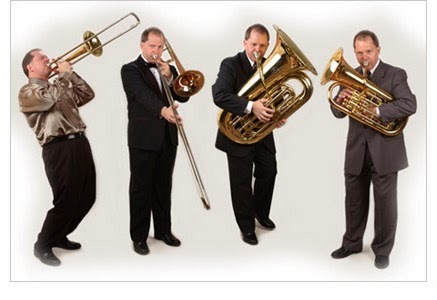 See how big that Euphonium is compared to the grown man on the right? Now imagine high school Teh Megan who weighed maybe 115 pounds carrying something like that around a football field for marching season. You can easily understand why concert season was my fave. Probably a condiment. Maybe the mustard? Does that go bad? Since I stopped playing WoW, my nerd level had decreased significantly. Since the PS3 entered the picture at Christmas, I've been playing a lot of Katamari Forever. Let's not talk about my weird dreams. How my character still looks to this day as I quit playing WoW soon after this. I have regifted something before, but I don't even remember what it was.. I once received 2 days of In-School Suspension because I was taking Accelerated Reader quizzes for a classmate since we had to obtain a certain amount of points per semester. Ironically, I had admitted this to Teh Mom the night prior to being caught. The morning we were caught I had taken a 2nd test for my friend. The weirdest part was that we weren't the only people doing it. 4 other people admitted to having the same arrangement and one guy was even paying another guy to take tests for him! Since I had taken 2 tests and everyone else had only taken 1 test, the blame was pinned on me as being the "ring-leader" even though the couples taking the tests for each other had no idea about the other couples that were taking tests. It was crazy 7th grade drama man. 13. What's the strangest talent you have? 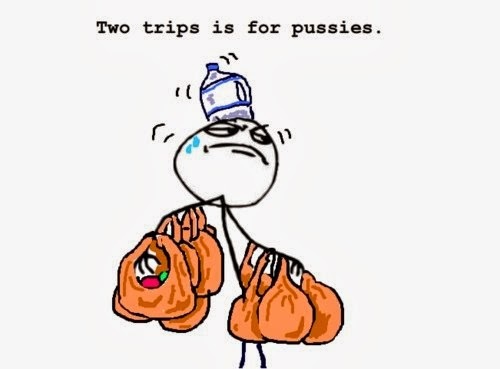 The ability to be able to carry ALL.THE.THINGS and still manage to open doors and not drop anything? 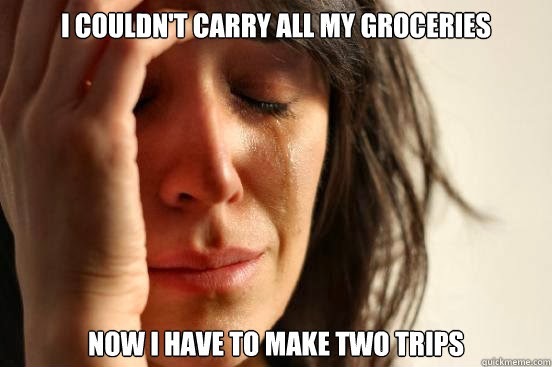 first world problems is my fave meme. ...and so applicable to so many things in my life that I whine about. Meggy-Poo (which is actually still my nickname from some people). Hair. I hate when loose hairs touch me. Teh Bear likes to pick my hairs off my shirt and threaten to touch my face with them... Jerk. 16. What's your favorite flavor of Pringles? Pizza. Is there another flavor of Pringles? YES! Teh Worldwide Jesus Lover has now written me TWO birthday poems! Over. So that way the paper falls where you can grab it. I'm pretty open about all the things. So I can't really come up with a good answer for this one. I mean, I openly admitted to loving Call Me Maybe by Carly Rae Jepsen. Ok fine, I got one. I could (and have) listened to Christina Perri's A Thousand Years on repeat.. for hours.. and again when I discovered Part 2. Judge me. Don't care. I don't really accept dares, so I can't think of a good answer for this one either. I'm such a bummer. Kindergarten during juice time. I initiated for like the only time ever in my life. Teleportation/the ability to summon items. Mostly because I'm so lazy. Frogs. OMG they were the worst. Their ribbits were very high pitched squeaking that kept me awake for nights on end. My first serious boyfriend gave them to me and I felt guilty giving them away to Teh Mom's friend, but I explained the situation to him and after he heard the noise, he understood.